1. I still love the smell of Drakkar Noir. Uh huh, from 1988. 2. Every time I use an interoffice envelope, I have to take my black Sharpie and carefully mark through every previous address on it an effort to undo the horrors of all the ballpoint-users and crooked labelers who went before me. I was reminded that I don't even consider those "locks." I push them in. 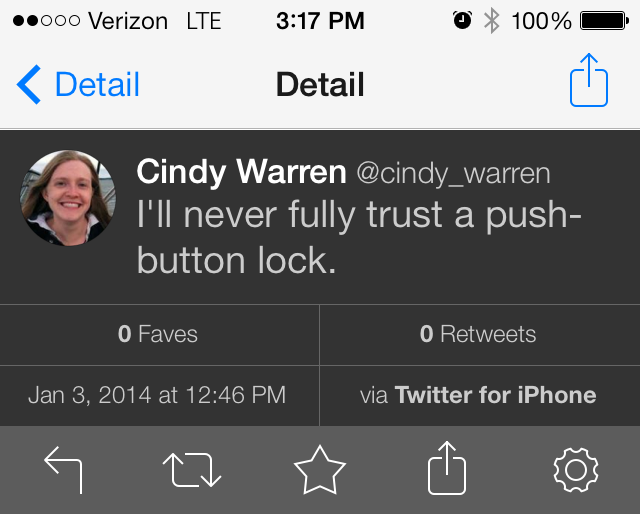 Then I turn the handle to see if it actually locked, thereby unlocking it (if it even locked in the first place). Then I do it again, to double-check. Then, if the toilet is anywhere close enough to the door, I'll sit with my foot against the door to try to prevent anyone from entering while I'm in there. Bottom line: THAT'S NOT A LOCK. 4. When I ran that 5k on Thanksgiving morning, I put One Direction's The Story of My Life on repeat and listened to it the entire time. It's a four-minute song. Took me 48 minutes to run the race. I don't math, but that's at least 12 listens. 5. Got out of the shower the other night and realized I'd only shaved ONE of my legs, if you were wondering what it's like to be senile at 40. If you liked these Uncomfortable Truths and would like to read more, click here to read the whole category -- in which I fully embarrass myself over four years' time or so. To the tune of more than 70 posts (with a little help from my friends, on some occasions).